A precipitous spike in rhino and elephant poaching has dominated environmental news in recent weeks, with record numbers of rhinos killed in South Africa last year and sting operations in multiple African nations uncovering elephant ivory bound for Asian markets. But look closer at the coverage, and you may also read about one obscure animal equally imperiled by the illegal wildlife trade — and a fraction the physical size of these headline-grabbing megafauna. Pangolins, also known as “scaly anteaters,” are small mammals primarily distinguished by hard, overlapping scales made of keratin, the same protein that constitutes human hair and fingernails. Found in Asia and sub-Saharan Africa, pangolins are solitary animals that use their extraordinarily long tongues to probe for ants and termites in mounds and decaying logs. All eight species of pangolins are at risk of extinction, with two species, the Sunda/Malayan Pangolin and the Chinese Pangolin, listed by the International Union for Conservation of Nature (IUCN) as critically endangered. The pangolin’s scales, skin and meat are all highly valued, making it the most illegally traded mammal in the wild, according to IUCN. Demand for pangolin meat as a delicacy is high among the newly affluent in parts of China and in Vietnam, while the animal’s scales have been used for centuries in Traditional Chinese Medicine for unproven health benefits. Over the past 20 years, the value of pangolin scales has exploded. According to China's State Forestry Administration, scales fetching the equivalent of about $4.50 a pound in the 1990s now routinely sell for nearly $80 a pound. Arrests and seizures of poached pangolins, while overshadowed by elephant and rhino poaching, have made recent headlines. Authorities in Uganda announced Sunday the seizure of two tons of pangolin skins discovered in boxes at the Entebbe International Airport, a key transit center for the illegal wildlife trade in central Africa. Also over the weekend, police in Zimbabwe arrested five pangolin poachers in two separate incidents. During one of those arrests, a live captured female was confiscated and sent to the Tiki Hywood Trust for treatment of multiple injuries. High-profile seizures of pangolin scales have occurred in Asia during recent months as well. Just last week, customs agents in China’s Guangxi Zhuang Autonomous Region busted a pangolin trafficking ring smuggling live pangolins from neighboring Vietnam. 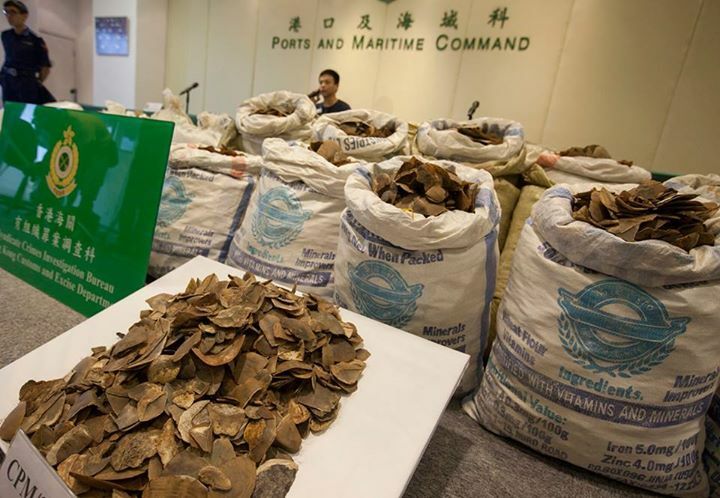 And WildAid was on hand in June as the Hong Kong Customs & Excise Department announced they had found two tons of pangolin scales hidden in a 20-foot container of timber. It was the largest seizure by Hong Kong customs officials in five years. As with other illegal wildlife products, educating consumers is crucial to reducing the demand and stopping the illegal trade of these vulnerable species. WildAid is currently researching the trade and how we might be able to impact the demand for pangolins within China, the principal market. More info: Yes, there is a World Pangolin Day, and it’s coming up soon. Read more here on this February 21 event and how you can participate. And below, check out this CNN piece from 2014 on the pangolin trade. Inside the illegal wildlife trade from CNN on Vimeo.